A reaction in which not only the reactants react to form the products under certain conditions but also the products react to form reactants under the same conditions is called a reversible reaction. If a reaction cannot takes place in the reverse direction i.e. the products formed do not react to give back the reactants under the same conditions, it is called irreversible reaction. 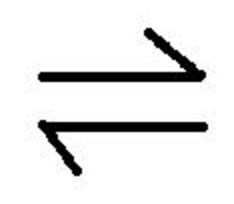 It is represented by putting a single arrow between the reactants and products, pointing from reactants towards products. A reversible reaction becomes irreversible if one product is allowed to escape out. 1) In the beginning the concentration of A and B are maximum and the concentration of C and D are minimum. 2) As the reaction proceeds, the concentration of A and B are decreasing with passage of time whereas the concentration of C and D are increasing. 3) The rate of forward reaction is decreasing while the rate of backward reaction goes on increasing. 4) A stage comes , when the rate of forward reaction becomes equal to rate of backward reaction. The reaction is then said to be in a state of chemical equilibrium. If the temperature of the furnace is kept constant and the vessel is connected to a manometer, the pressure first keeps on increasing and ultimately becomes constant. Now as much of CO2 is formed from CaCO3 ,the same amount of CO2 reacts with CaO to give back CaCO3. The rate of forward reaction and backward reaction have become equal. Hence the reaction have attained chemical equilibrium. N2O4 is almost stable at 0° C and is almost colourless. If N2O4 is taken in a glass bulb which is then sealed and placed in ice, it is almost colourless. If the sealed glass bulb is shifted into a vessel containing water at 25°C , the bulb starts acquiring brown colour which first deepens and then becomes constant. This indicates a state of equilibrium in which the concentration of N2O4 and NO2 have become constant. That both are present in the reaction mixture can be tested by increasing the temperature of the bulb further when brown colour depends and by cooling the bulb down from 25°C when the brown colour fades. If H2 and I2 are enclosed in a glass bulb at 500°C ,the colour is deep purple in the beginning but as the time passes ,the intensity of the colour decreases and then no further change in colour is observed .This again indicates that the reaction has attained a state of equilibrium. When the equilibrium is reached, the concentration of each of the reactants and products become constant. In the reaction between H2 and I2 to form HI , the colour becomes constant because the concentration of H2 , I2 and HI becomes constant. As much of the reactants react to form the products ,the same amount of products react to give back the reactants in the same time. Hence the equilibrium is dynamic in nature and not static. In the Haber’s process ,starting with definite amount of N2 and H2 and carrying out the reaction at a particular temperature, when equilibrium is attained ,the concentration of N2, H2 and NH3 become constant. If the experiment is repeated by taking deuterium in place of H2 but with the same amounts and exactly similar as before equilibrium is attained containing D2 and ND3 in place of H2 and NH3 but in the same amount. If the two reaction mixtures are mixed ,then after sometime, it is found that the concentration of ammonia and hydrogen are same except that now all forms of ammonia and all forms of hydrogen are present. This shows that an equilibrium , the reaction is still going on i.e. equilibrium is dynamic in nature. 1) At equilibrium, the concentration of each of the reactants and products becomes constant. For ex: The constancy of pressure in the evaporation of water , decomposition of calcium carbonate and constancy of colour at equilibrium in the decomposition of N2O4. 2) At equilibrium the rate of forward reaction becomes equal to that of backward reaction and hence the equilibrium is dynamic in nature. 3) A chemical equilibrium can be established only if none of the products is allowed to escape out or separate out as solids. 4) Chemical equilibrium can be attained from either direction i.e. from the direction of the reactants as well as from the direction of the products. A catalyst increases the speed of the forward reaction as well as that of the backward reaction to same extent. Hence, the equilibrium is not disturbed i.e. at equilibrium the concentration of each of the reactant and the product is same as found at equilibrium when no catalyst was added. The only effect of adding the catalyst is that equilibrium is attained quickly.